A recent regional road tour through Victoria to South Australia showed how a focus on arts and culture is a pointer for how regional centres can take a path other than slow decline. It also showed how a small country on the edges of the mainstream can become a global design force by staying true to its language, locality and culture – the things that make it distinctive in a crowded, noisy marketplace dominated by big, cashed up players. From there it was time to hit the road to Bendigo, one of my favourite places in Victoria. I've been visiting the Bendigo Art Gallery for quite a few years now. It presents fashion and design exhibitions that you can't see anywhere else in Australia. I've seen a string of them. Apart from the ones the gallery curates, it seems to have a special arrangement with the Victoria and Albert Museum in London. It's certainly a pointer for how a regional city can take a path other than slow decline. I saw an extensive Marimekko exhibition from the Design Museum in Helsinki. Ironically its most well known design, the poppy motif, is referred to as 'the rebel flower' because the designer disregarded the dictum that Marimekko would never use floral motifs. The exhibition shows how a small country on the edges of the mainstream can become a global design force by staying true to its language, locality and culture – the things that make it distinctive in a crowded, noisy marketplace dominated by big, cashed up players. The company was established in the 1950s when Finland was becoming increasingly urbanised and traditional roles for women were breaking down. It then remade itself numerous times in the subsequent decades. Fascinating, illuminating and highly relevant to Australia and its creative industries. On the road towards Dunkeld at the southern end of the Grampians, I heard Phillip Adams on ABC radio interviewing Marcia Langton about her new book about experiencing Aboriginal Australia, 'Welcome to Country'. It turns out the Grampians are a favourite of hers, a huge outcrop remnant of Gondwanaland, immensely ancient and alien. In fact all the way on the trip I listened to ABC radio. It makes travelling so much easier that if our Government persists in cutting its funding, eventually I won't be able to drive anywhere. Given the role of the ABC in regional areas, the Govermment stance on the broadcaster seems to show how out of touch it is with regional communities. From there the trip went through the West Wimmera, with a stop in tiny Harrow. Not for the first time I found it incredibly sobering to reflect on how many tiny Australian country townships sport monuments to disproprtionately high head counts of fallen in the First World War. I passed through Edenhope, with its Mechanics Institute on the main street and its story of the first International Australian Aboriginal Cricket team from these parts which against all the odds toured England in 1868. Harrow claims to have the largest Bradman collection in Australia. 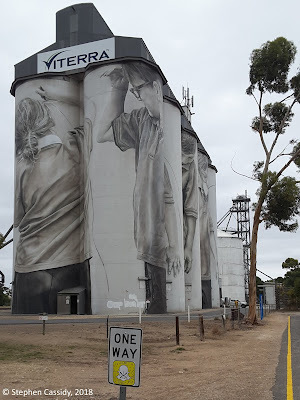 On a long stretch of fairly unremarkable towns, Coonalpyn – itself a fairly unremarkable town – rose up, with the magnificent monochromatic murals of Guido van Helten on the grain silos. Just in the brief time I was there, five other people stopped to photograph them. The impact in terms of attractive local business in the tiny township since I last passed through was graphic, with a highly regarded Belgian waffle shop having popped up to accompany the murals. 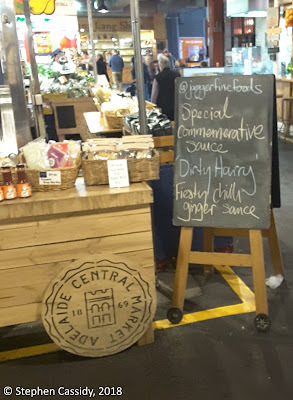 Adelaide Central Market marks that wedding. In Adelaide I had to visit all the usual icons. I am perpetually astounded at just how good the Central Market is. I rediscover it afresh each time I visit the city. In the past whole cities were established around river junctions and crossroads and markets. The Central Market is so good that if you dropped it down anywhere, a city would soon spring up around it. High point of the cultural tour in Adelaide was the ‘Colours of Impressionism’ exhibition at the Art Gallery of SA, with paintings from the Musee d'Orsay. I've seen many Impressionist works and I've been to the Musee d'Orsay, but this was a very different and fascinating take on the artworks, presented with a great deal of knowledge and scholarship. I was told of someone who’d been four times. I can believe it. Then I discovered the rest of the exhibitions in this crowded Art Gallery. ‘Help’, I called, ‘I am trapped in the Art Gallery of South Australia.’ I hadn't been there for years. I should have taken a packed lunch. Many years ago I tried to see the whole of the National Gallery of Victoria in one visit. I almost died. This time I was outta there – till next time. On the way back home I stopped in Kyneton where I checked out a lost trades shop, with an impressive collection of hand made Swedish axes and English gardening tools. They had drawn on the work of Mark Thomson on rare trades, exhibited at the National Museum of Australia. I almost didn’t see the shop and when I arrived back home I discovered that in the rush to get away I had missed an article in the Sydney Morning Herald by Gabriella Coslovich the weekend before I left that mentioned it in detail. The article crossed over numerous of my areas of interest. Firstly, there was the contemporary craft movement, aligned with my past and current involvement with Craft ACT and DESIGN Canberra. Linked to this, there were two apparently contradictory phenomenon that in reality make so much sense – the rediscovery of regional life complementing the increasing urbanisation of the world and the intersection of the hand-made with the ubiquitous digital universe. After Kyneton I skirted Melbourne past Hanging Rock (that well known picnic place). Regional road trips through Victoria are always fun. The state is narrow from North to South, even if West to East is a hike. The good thing is there are lots of interesting townships, close together. Supposedly the whole of the UK would fit into Victoria. I realised that I enjoyed listening to ABC radio so much on the trip that as soon as I get home I intended to subscribe to a whole pile of podcasts. I sort of missed the podcast thing, so I'll have to work out how it all comes together. The final cultural event during the trip that I have to report on was something unexpected. I know it was uncool to watch that wedding on television. Remembering the treason songs of my youth, for me the word I tend to associate with thoughts of ‘royalty’ is ‘guillotine’ – I blame it on the example of those riotous French. However, if you are interested in popular culture in all its forms, as I am, it’s hard to avoid. You have to teach yourself how to read it. To top it off my mother, who was a gun seamstress in her time, was the maker of mighty wedding dresses. The underlying purpose of my trip to Adelaide had been her 90th birthday. Way back in the 1950s, in the tiny village of Bronte Park in central Tasmania – a universe far, far away in time and space ­– she rode in costume on a makeshift float thrown together to commemorate the Coronation, at a time when Australia was much more enthusiastic about the monarchy. Watching the wedding I was channelling her. It was a curious event to watch. Meghan Markle’s mother was all style, grace and dignity in a world of strangers. I gather there’s been some comment in the gutter press in Britain about her being a descendant of slaves – to my mind it’s better to be a descendant of slaves than of slave owners. Then there was the music – ‘Stand by me’, a good choice on any occasion, with a choir flaunting the stylish face of contemporary Britain, but actually Britain from the 1950s onwards. Contemporary Britain is even more diverse. Everybody was frocked up. At one stage towards the end of the ceremonies the Queen looked quite dazed – perhaps it was hearing the words ‘Martin Luther King’ twice in the same building, perhaps it was hearing them twice in the same lengthy speech. This most recent royal wedding was the perfect example of using every piece of cultural symbolism available to stress the continuity of history – and even picking up some of the history of other people along the way. No-one has to tell royalty that culture counts – and the more popular the better. Seeing and understanding the power of culture to embed wealth and privilege – and hence the potential to do the opposite – was the ideal way to round out my cultural tour of the highways and backroads of contemporary Australian life. ‘It’s been apparent for some time that regional centres and smaller cities and towns can be interesting and creative places and that cities that have missed out on the benefits of globalisation in the era of neo-liberalism can be brought back by community action and imagination. It’s certainly not happening everywhere but it’s true of many lucky regional towns and cities and some suburban and outer suburban areas – witness Sydney, where it’s increasingly clear that the excitement never really stopped at the edges of the inner city. The regional rollout of interesting keeps on happening’, Regional Australia recognised with City of Culture listing for Bendigo and surrounds. ‘When I was visiting Paris last year, there was one thing I wanted to do before I returned home – visit the renowned French bakery that had trained a Melbourne woman who had abandoned the high stakes of Formula One racing to become a top croissant maker. She had decided that being an engineer in the world of elite car racing was not for her, but rather that her future lay in the malleable universe of pastry. Crossing boundaries of many kinds and traversing the borders of differing countries and cultures, she built a radically different future to the one she first envisaged’, Crossing boundaries – the unlimited landscape of creativity. ‘With arts and cultural support increasingly under pressure, arts and cultural organisations and artists are trying to find ways in their own localities to respond and to help build a popular understanding of the broader social and economic benefits of arts and culture. Much work has been done in Australia and internationally to understand, assess and communicate the broad value of arts and culture. The challenge is to share and to apply what already exists – and to take it further’, What is art good for? Understanding the value of our arts and culture. ‘If you are losing track of the articles I have published to my 'indefinite article' blog over the last few years, this is a summary of all 133 articles up until mid July 2017, broken down into categories for easy access. They range from the national cultural landscape to popular culture, from artists and arts organisations to cultural institutions, cultural policy and arts funding, creative industries, First Nations culture, cultural diversity, cities and regions, Australia society, government, Canberra and international issues – the whole range of contemporary Australian arts and culture’, See also – indefinite articles in a definite world. ‘The arts and culture sector has long suffered from a shortage of high quality, useable research and statistics. This makes what is available doubly important as we argue the case for the central relevance of arts and culture and the broader social and economic impact of involvement. New research demonstrates the positive scale of involvement, views on importance and trends in participation in Australia’s arts and cultural life, especially hands on involvement. It also shows a worrying decline in engagement and recognition in recent years and points to the need for a more strategic view by government’, Taking part – Arts involvement in a divided Australia. ‘Australia’s arts and culture is at a critical stage. One of the issues confronting it is lack of any kind of shared sense of what the role of government is in encouraging our arts and culture. The whole set of interlinked problems with the relationship between government and Australia’s arts and culture can be reduced to a lack of strategic vision and a long-term plan for the future. This deficiency is most apparent in the lack of any guiding policy, like trying to navigate a dark and dangerous tunnel without a torch or flying at night without lights or a map’, Creating the future for Australia's arts and culture. If the arts are important but not enough people know it, are they really important? ‘As the new landscape of Australia’s arts and culture emerge in the post-Brandis era, we are starting to see how organisations are adapting and the issues they are facing in doing so. To a lesser degree we are also seeing how artists themselves are responding. It seems clear that the absence of any overall strategic approach to arts and culture – whether from the Government or from the arts and culture sector – is having a deadening effect’, If the arts are important but not enough people know it, are they really important? ‘The never-ending election campaign that became the never-ending election tally has turned into the unpredictable second term government. What does this new world of fragmented politics mean for Australian arts and culture and the organisations, artists and communities which live it and advance it? There are a series of major factors which are hammering arts and culture organisations. These intersect and mutually reinforce one another to produce a cumulative and compounding long term disastrous impact. All this is happening in a context where there is no strategic policy or overview to guide Government. It is critical for the future that the arts and culture sector think broadly about arts and culture, build broad alliances and partnerships, never forget its underlying values and draw on its inherent creativity to help create a society based firmly on arts and culture’, The big picture and long view – creating a cultural future. ‘I’ve said before that the traditional saying about ‘lies, damned lies and statistics’, should instead refer to ‘lies, damned lies and lies about statistics’. Cuts to national arts and cultural funding, while relatively small each year, have a cumulative effect far greater than at first appears and, in the long run, will undermine the effectiveness of national arts and culture support. Where the real disastrous impact of these cuts will hit home is when we also factor in the impact of population growth. If anything, there needs to be an expansion of arts and cultural funding to service the growth’, Lies, damned lies and lies about statistics – how population growth will magnify the impact of arts and culture cuts. ‘There’s an election in the air and I was thinking about what would be a good list of positive improvements that would benefit Australia’s arts and culture, so I jotted down some ideas. They are about recognising arts and culture as a central part of everyday life and an essential component of the big agenda for Australia. They are about where the knowledge economy, creative industries and arts and culture fit, how arts and culture explain what it means to be Australian and how they are a valuable means of addressing pressing social challenges’, Arts and culture part of everyday life and on the main agenda. Full circle – where next for Australian national arts and culture support in the 21st Century? ‘With a Coalition Government which now stands a far better chance of being re-elected for a second term, the transfer of the Commonwealth’s Arts Ministry to Communications helps get arts and culture back onto larger and more contemporary agendas. This move reflects that fact that the new industries in the knowledge economy of the future, with its core of creative industries and its links to our cultural landscape, are both clever and clean. Where they differ completely from other knowledge economy sectors is that, because they are based on content, they draw on, intersect with and contribute to Australia’s national and local culture and are a central part of projecting Australia’s story to ourselves and to the world. In that sense they have a strategic importance that other sectors do not’, Full circle – where next for Australian national arts and culture support in the 21st Century? ‘A far more important issue than arts funding is how can the broad arts and cultural sector become a better organised, effective voice for arts and culture and its wider importance for Australia? Changes like this happen because they are able to happen – because decision-makers think they can get away with it. The arts and culture sector and its supporters have to be influential enough that decision-makers think carefully about the importance and the standing of Australia’s arts and culture and weigh any decisions they make carefully in terms of the strategic needs of the sector. These current dire circumstances may provide the opportunity we have needed to look seriously at this question’, Time for the big picture and long view for arts and culture. Art for arts sake, art for society’s sake or arts as entertainment? ‘Case studies and anecdotal evidence show that involvement in cultural (and sporting) activity – by both Indigenous and non-Indigenous communities – often has powerful flow on social and economic effects. However, this is not why people are involved in cultural activity – it’s just a bonus. It shouldn’t be ignored and it can be harnessed to good effect but we have to be careful not to focus just on the side effects, no matter how important. Cultural activity is an expression of who we are, what we value and how we see ourselves and our place in the world. That’s much more important. Few would suggest that non-Indigenous culture should only be supported where it can be shown to produce some social or economic impact. Indigenous culture is far more than a way of fixing social problems – it is a powerful positive force in Australian culture, a central part of our presence in the world’, Art for arts sake, art for society’s sake or arts as entertainment? ‘I always thought that long after all else has gone, after government has pruned and prioritised and slashed and bashed arts and cultural support, the national cultural institutions would still remain. They are one of the largest single items of Australian Government cultural funding and one of the longest supported and they would be likely to be the last to go, even with the most miserly and mean-spirited and short sighted of governments. However, in a finale to a series of cumulative cuts over recent years, they have seen their capabilities to carry out their essential core roles eroded beyond repair. The long term impact of these cumulative changes will be major and unexpected, magnifying over time as each small change reinforces the others. The likelihood is that this will lead to irreversible damage to the contemporary culture and cultural heritage of the nation at a crucial crossroads in its history’, Cut to the bone – the accelerating decline of our major cultural institutions and its impact on Australia’s national heritage and economy. ‘In the arts, from a virtual policy-free zone, we’ve now got policies – not as many as we could have hoped, but enough to be going on with. Some of them might even get implemented. Importantly, the others will help to frame the debate and offer ideas for the future. Those parties that have arts policies offer good solid and productive proposals which, if implemented, would lead to definite improvement for Australia’s arts and culture. However, that’s just the starting point’, Arts, culture and a map of the future – the limits of arts policy. ‘National Arts Minister, Mitch Fifield, has said that being a strong advocate for the arts doesn’t mean delivering government funding and that an arts Minister or a government shouldn’t be judged just on the quantum of money the government puts in. This sidesteps the Government’s very real problems that it has muddied the waters of existing arts funding, cutting many worthwhile organisations loose with no reason, that rather than delivering arts funding, it has reduced it significantly, and that it has no coherent strategy or policy to guide its arts decisions or direction. The real issue is that a national framework, strategy or policy for arts and culture support underpins and provides a rationale for arts funding – and is far more important’, Arts funding – it’s not all about the money. Dear Treasurer – our arts are central to everyday life, why doesn’t funding reflect it? ‘In response to steadily diminishing support for arts and culture by government, it's crucial to recognise that Australia's arts are central to everyday life and should be firmly on the main national agenda. Apart from their value in maintaining a thriving Australian culture, the range of social and economic benefits they deliver and their role in telling Australia's story to ourselves and the world make them an essential service’, Dear Treasurer – our arts are central to everyday life, why doesn’t funding reflect it? ‘In many ways design is a central part of the vocabulary of our time and integrally related to so many powerful social and economic forces – creative industries, popular culture, the digital transformation of society. Design is often misunderstood or overlooked and it's universal vocabulary and pervasive nature is not widely understood, especially by government. In a rapidly changing world, there is a constant tussle between the local and the national (not to mention the international). This all comes together in the vision for the future that is Design Canberra, a celebration of all things design, with preparations well underway for a month long festival this year. The ultimate vision of Craft ACT for Canberra is to add another major annual event to Floriade, Enlighten and the Multicultural Festival, filling a gap between them and complementing them all’, Designs on the future – how Australia’s designed city has global plans. ‘It is becoming abundantly clear that in our contemporary world two critical things will help shape the way we make a living – and our economy overall. The first is the central role of cities in generating wealth. The second is the knowledge economy of the future and, more particularly, the creative industries that sit at its heart. In Sydney, Australia’s largest city, both of these come together in a scattering of evolving creative clusters – concentrations of creative individuals and small businesses, clumped together in geographic proximity. This development is part of a national and world-wide trend which has profound implications’, Creativity at work – economic engine for our cities. ‘Across Australia, local communities facing major economic and social challenges have become interested in the joint potential of regional arts and local creative industries to contribute to or often lead regional revival. This has paralleled the increasing importance of our major cities as economic hubs and centres of innovation’, The immense potential of creative industries for regional revival. ‘The swan song of the Creative Industries Innovation Centre, ‘Creative Business in Australia’, outlines the experience of five years supporting Australia’s creative industries. Case studies and wide-ranging analysis explain the critical importance of these industries to Australia’s future. The knowledge economy of the future, with its core of creative industries and its links to our cultural landscape, is both clever and clean. Where the creative industries differ completely from other knowledge economy sectors is that, because they are based on content, they draw on, intersect with and contribute to Australia’s national and local culture’, The clever business of creativity: the experience of supporting Australia's industries of the future. ‘The developing creative industries are a critical part of Australia’s future – clean, innovative, at their core based on small business and closely linked to the profile of Australia as a clever country, both domestically and internationally.’ Creative industries critical to vitality of Australian culture. ‘My nephew just got a job in Wellington New Zealand with Weta Digital, which makes the digital effects for Peter Jackson’s epics. Expertise, specialist skills and industry pockets can occur just about anywhere, as long as you have connectivity, talent and a framework of support that makes it possible. This is part of the new knowledge economy of the future, with its core of creative industries and its links to our cultural landscape. Increasingly the industries of the future are both clever and clean. At their heart are the developing creative industries which are based on the power of creativity and are a critical part of Australia’s future – innovative, in most cases centred on small business and closely linked to the profile of Australia as a clever country, both domestically and internationally. This is transforming the political landscape of Australia, challenging old political franchises and upping the stakes in the offerings department’, My nephew just got a job with Weta – the long road of the interconnected world. ‘I have been dealing with the issue of creativity for as long as I can remember. Recently, I have had to deal with a new concept—innovation. All too often, creativity is confused with innovation. A number of writers about innovation have made the point that innovation and creativity are different. In their view, innovation involves taking a creative idea and commercialising it. If we look more broadly, we see that innovation may not necessarily involve only commercialising ideas. Instead the core feature is application—innovation is applied creativity. Even ideas that may seem very radical can slip into the wider culture in unexpected ways’, Applied creativity. ‘The nineteenth century fascination with applied arts and sciences — the economic application of nature, arts and sciences — and the intersection of these diverse areas and their role in technological innovation are as relevant today for our creative industries. From the Garden Palace, home of Australia’s first international exhibition in 1879, to the Economic Gardens in Adelaide’s Botanic Gardens these collections and exhibitions lay the basis for modern Australian industry. The vast Garden Palace building in the Sydney Botanic Gardens was the Australian version of the great Victorian-era industrial expositions, where, in huge palaces of glass, steel and timber, industry, invention, science, the arts and nature all intersected and overlapped. Despite burning to the ground, it went on to become the inspiration for what eventually became the Museum of Applied Arts and Sciences — the Powerhouse Museum’, Creative Industries. ‘I’ve travelled around much of Australia, by foot, by plane, by train and by bus, but mostly by car. As I travelled across all those kilometres and many decades, I never realised that, without ever knowing, I would be silently crossing from one country into another, while underneath the surface of the landscape flashing past, languages were changing like the colour and shape of the grasses or the trees. The parallel universe of Indigenous languages is unfortunately an unexpected world little-known to most Australians.’ The hidden universe of Australia's own languages. 'Subsidised Indigenous arts and cultural jobs are real jobs with career paths that deliver genuine skills and employment capability.' Real jobs in an unreal world. Why cultural diversity is central to Australia’s future promise – a refocused Labor arts policy? ‘Can Australia successfully navigate the treacherous and confusing times in which we live? Understanding the crucial importance of our cultural diversity to our cultural, social and economic future will be essential. Applying that in the policies and practices that shape our future at all levels across Australia can ensure we have a bright, productive and interesting 21st Century. An important part of this are the political parties, major and minor, that are increasingly negotiating the compromises that shape our world. The recent launch by the Labor Party of a new group, Labor for the Arts, could be an important development. Combining as it does a focus from an earlier time on both arts and multiculturalism, it could potentially open the way for some innovative and forward-thinking policy’, Understanding why cultural diversity is central to Australia’s future promise – a refocused Labor arts policy? The easiest way to hear about new posts to this blog when they are added from time to time is to follow by email. Just fill in your email address below and you will get an email confirming you want to get notifications - just click on the link in the email to confirm. Then every so often you will receive an email with a link to the latest post. Stephen Cassidy is a cultural researcher and writer who has worked across the Australian cultural sector for 40 years. This has spanned policy, programs and research in government, museums, publishing, community arts and radio in four states and territories at national, state and local level. It has encompassed creative industries – including contemporary music and literature – intangible cultural heritage and Indigenous culture and languages. He was Director of the National Cultural Policy Task Force, wrote the proposal that initiated the Digital Content Industry Action Agenda, drafted the Indigenous Contemporary Music Action Plan and played an instrumental role in the adoption of Australia’s first National Indigenous Languages Policy. He has been a Community Arts Officer in local government, ACTU Arts Officer, Development Manager at community radio 2SER-FM and Membership Manager for the Powerhouse Museum. His writing has appeared in a range of publications, been recognised in various literary awards and competitions and included in several exhibitions. He is currently a member of ACT independent arts forum, the Childers Group, and an Adjunct with the University of Canberra. indefinite article: irreverent articles about contemporary Australian society, popular culture, the creative economy and the digital and online world – life in the trenches and on the beaches of the information age. balloon: thought balloons for our strange and unsettled times – short, quirky articles about the eccentricities of everyday life, almost always with a sense of short black humour. handwriting: homegrown graffiti from the digital world – writing, rhyming and digital animations. tableland: land to table – the daily routine of living in the high country, on the edge of the vast Pacific, just up from Sydney, just down from Mount Kosciuszko. indefinite article on Facebook: short arts updates and cultural commentary. Twitter short, sharp and shiny. Silent retreat – is arts funding becoming project funding? All material including images and text © Stephen Cassidy. All opinions expressed are the personal views of the author. All material including words and images © Stephen Cassidy. Simple theme. Powered by Blogger.